Where can McCartney play next? It only took 43 years, but Sir Paul McCartney finally played his first concert in Israel tonight (Sept. 25), kicking off the show with The Beatles' Hello Goodbye in front of 40,000 cheering fans. Paul McCartney called the concert "Friendship First," explaining that he was on a mission of peace for Israel and the Palestinians. 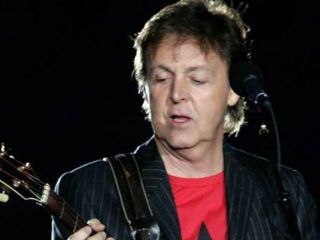 The crowd cheered and screamed as the 66-year-old ex-Beatle performed in Tel Aviv's outdoor Yarkon Park. Many were seen wearing T-shirts with the slogan, "I love Paul." Macca greeted the crowd with a mixture of English and Hebrew, wishing them "shana tova," happy new year, ahead of next week's Jewish new year holiday. As would be expected, his repertoire drew heavily on Beatles hits, but he also added songs from his post-Beatles group, Wings. While singing Give Peace a Chance (a song he dedicated to John Lennon), McCartney stopped and let the audience sing the chorus alone. Sir Paul was first scheduled to appear with The Beatles in 1965. But in one of the country's most widely repeated tales, an Israeli official supposedly called off the concert for fear it would corrupt the nation's youth. When McCartney's "Friendship First" concert was announced, it was greeted with a wave of enthusiasm throughout Israel, a country that sees few A-list performers. But there were protesters who objected to the show and asked McCartney to reconsider playing because of Israel's occupation of the West Bank. "I get criticized everywhere I go, but I don't listen to them," McCartney said. "I'm bringing a message of peace, and I think that's what the region needs." There were also death threats directed at the ex-Beatle, namely from Omar Bakri, a Syrian-born extremist cleric, who warned McCartney that his life was in danger should he perform. Although hundreds of police and private security guards were deployed, there was no concrete evidence of threats against McCartney, and the concert came off without incident. Here's a video that's sure to put a smile on your face: Paul playing All My Loving to a crowd that knows every word. Great stuff. Somewhat forgotten in all of this but it must be mentioned -Ted Nugent didn't have to whip out his crossbow.